Tim Berners-Lee's vision for the World Wide Web was close to a P2P network in that it assumed each user of the web would be an active editor and contributor, creating and linking content to form an interlinked "web" of links. The early Internet was more open than present day, where two machines connected to the Internet could send packets to each other without firewalls and other security measures. This contrasts to the broadcasting-like structure of the web as it has developed over the years. As a precursor to the Internet, ARPANET was a successful client-server network where "every participating node could request and serve content." However, ARPANET was not self-organized, and it lacked the ability to "provide any means for context or content-based routing beyond 'simple' address-based routing." An anonymous P2P communication system is a peer-to-peer distributed application in which the nodes, which are used to share resources, or participants are anonymous or pseudonymous. Anonymity of participants is usually achieved by special routing overlay networks that hide the physical location of each node from other participants. Interest in anonymous P2P systems has increased in recent years for many reasons, ranging from the desire to share files without revealing one's network identity and risking litigation to distrust in governments, concerns over mass surveillance and data retention, and lawsuits against bloggers. A content delivery network or content distribution network (CDN) is a geographically distributed network of proxy servers and their data centers. The goal is to provide high availability and high performance by distributing the service spatially relative to end-users. CDNs serve a large portion of the Internet content today, including web objects (text, graphics and scripts), downloadable objects (media files, software, documents), applications (e-commerce, portals), live streaming media, on-demand streaming media, and social media sites.CDNs are a layer in the internet ecosystem. Content owners such as media companies and e-commerce vendors pay CDN operators to deliver their content to their end users. In turn, a CDN pays ISPs, carriers, and network operators for hosting its servers in their data centers. P2P Foundation: The Foundation for Peer to Peer Alternatives is an organization with the aim of studying the impact of peer to peer technology and thought on society. It was founded by Michel Bauwens, James Burke and Brice Le Blévennec.The P2P Foundation is a registered institute founded in Amsterdam, Netherlands. Its local registered name is: Stichting Peer to Peer Alternatives, dossier nr: 34264847. Peer-to-peer carsharing (also known as person-to-person carsharing and peer-to-peer car rental) is the process whereby existing car owners make their vehicles available for others to rent for short periods of time. Businesses within this sector screen participants (both owners and renters) and offer a technical platform, usually in the form of a website and mobile app, that brings these parties together, manages rental bookings and collects payment. Businesses take between 25% and 40% of the total income, which covers borrower/renter insurance, operating expenses, and roadside assistance. As with person-to-person lending, the Internet and the adoption of location-based services have contributed to the growth of peer-to-peer carsharing. Peer-to-peer file sharing technology has evolved through several design stages from the early networks like Napster, which popularized the technology, to the later models like the BitTorrent protocol. Microsoft uses it for Update distribution (Windows 10) and online playing games (e.g. the mmorpg Skyforge) use it as their content distribution network for downloading large amounts of data without incurring the dramatic costs for bandwidth inherent when providing just a single source. Several factors contributed to the widespread adoption and facilitation of peer-to-peer file sharing. These included increasing Internet bandwidth, the widespread digitization of physical media, and the increasing capabilities of residential personal computers. Users are able to transfer one or more files from one computer to another across the Internet through various file transfer systems and other file-sharing networks. Also known as crowdlending, many peer-to-peer loans are unsecured personal loans, though some of the largest amounts are lent to businesses. Secured loans are sometimes offered by using luxury assets such as jewelry, watches, vintage cars, fine art, buildings, aircraft and other business assets as collateral. They are made to an individual, company or charity. Other forms of peer-to-peer lending include student loans, commercial and real estate loans, payday loans, as well as secured business loans, leasing, and factoring.The interest rates can be set by lenders who compete for the lowest rate on the reverse auction model or fixed by the intermediary company on the basis of an analysis of the borrower's credit. The lender's investment in the loan is not normally protected by any government guarantee. On some services, lenders mitigate the risk of bad debt by choosing which borrowers to lend to, and mitigate total risk by diversifying their investments among different borrowers. Other models involve the P2P lending company maintaining a separate, ringfenced fund, such as RateSetter's Provision Fund, which pays lenders back in the event the borrower defaults, but the value of such provision funds for lenders is subject to debate.The lending intermediaries are for-profit businesses; they generate revenue by collecting a one-time fee on funded loans from borrowers and by assessing a loan servicing fee to investors (tax-disadvantaged in the UK vs charging borrowers) or borrowers (either a fixed amount annually or a percentage of the loan amount). Compared to stock markets, peer-to-peer lending tends to have both less volatility and less liquidity. Peer-to-peer ridesharing can be divided along the spectrum from commercial, for-fee transportation network companies (TNC) to for-profit ridesharing services to informal nonprofit peer-to-peer carpooling arrangements. The term transportation network company comes from a 2013 California Public Utilities Commission ruling that decided to make the TNC revenue model legal.Essentially all modern peer-to-peer ridesharing schemes rely on web application and mobile app technology. Private peer-to-peer (P2P) systems are peer-to-peer (P2P) systems that allow only mutually trusted peers to participate. This can be achieved by using a central server such as a Direct Connect hub to authenticate clients. Alternatively, users can exchange passwords or cryptographic keys with friends to form a decentralized network. Private peer-to-peer systems can be divided into friend-to-friend (F2F) and group-based systems. Friend-to-friend systems only allow connections between users who know one another, but may also provide automatic anonymous forwarding. Group-based systems allow any user to connect to any other, and thus they cannot grow in size without compromising their users' privacy. 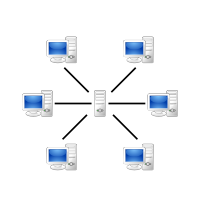 Some software, such as WASTE, can be configured to create either group-based or F2F networks. The sharing economy, also known as the access economy, peer-to-peer (P2P) economy, or collaborative economy is a mode of consumption whereby goods and services are not owned by a single user, but rather only temporarily accessed by members of a network and underutilized assets are shared, either for free or for a fee. It includes "sharing, bartering, lending, trading, renting, gifting, and swapping redefined through technology and peer communities." Other examples include: exchanging, collective purchasing, shared ownership, shared value, borrowing, and subscription based models. It is based on the idea that having access to a good or a service can be preferable to having ownership of such good or service and that there are benefits to collaboration in ownership. It refers to a hybrid market model of peer-to-peer exchange.The access economy has grown with information technology and is now primarily facilitated by intermediaries or brokers via websites and mobile apps. Uberisation refers to the rise of the access economy.In 2015, $26 billion in transactions were a result of the access economy.The access economy faces regulatory and political challenges, such as: defining the nature of the employment relationship between the facilitator and the service provider; designing regulations to safeguard parties to access economy transactions; taxation; and compliance with legacy regulations, such as the long-time requirement for taxi drivers to provide wheelchair vans.The sharing economy can refer to social peer-to-peer processes that include sharing of access to goods and services, or any rental transaction facilitated by a two-sided market, including business to consumer (B2C). For this reason, the term sharing economy has been criticised as misleading, as some argue that even services that enable peer-to-peer exchange can be primarily profit-driven.The sharing economy is related to the circular economy, which minimizes waste and includes co-operatives, co-creation, recycling, upcycling, re-distribution, and trading used goods. It is also closely related to collaborative consumption in which an item is consumed by multiple people. Social peer-to-peer processes are interactions with a peer-to-peer dynamic. These peers can be humans or computers. Peer-to-peer (P2P) is a term that originated from the popular concept of the P2P distributed computer application architecture which partitions tasks or workloads between peers. This application structure was popularized by file sharing systems like Napster, the first of its kind in the late 1990s. Yourdrive is a New Zealand peer-to-peer carsharing company. It facilitates a system in which individuals may rent their privately owned vehicles on an hourly, daily or weekly basis to other registered users of the service. Owners set their rental prices and earn a 60 percent commission from the rental revenue. It currently operates in throughout New Zealand with vehicles in Auckland, Hamilton, Palmerston North, Wellington, Christchurch, Dunedin. New Zealand rental car firm JUCY purchased 50% of the company in 2016Peer-to-peer carsharing is an example of collaborative consumption, where assets and skills are shared or traded between neighbours for sustainability and economic benefit. Although car sharing is relatively new in New Zealand it is an area that is being encouraged due to the environmental and economic benefits. Auckland Transport is promoting a scheme that would drastically increase the number of car sharing vehicles.